Many thanks to Nicholas, of Notice Life, for sending over some stationary geared towards increasing productivity. Above we have the A3 (420mm x 297mm) Project Plan Pad. This thing is huge, which is perfect to keep on your desk as you track your projects and subsequent tasks. Let's take a closer look. For each project being planned, one can track the start and finish time of the project, as well as the duration, start, finish, 'others', and cost associated with each task. There is also a notes section along the right margin for other relevant details. The notes section gets progressively smaller due to the design stretching over from the cost column, so this is something to take into consideration, but I will say that the design adds some interest to the overall look. One of my roles at work consists of process improvement, so I will be using this Project Plan Pad to create outlines for the process flows that will be moved to Microsoft Visio. I also tore some sheets from the pad to identify the required tasks and costs associated with upcoming home repair projects. Planning projects is good and well, but how about the paper quality? In each Project Plan Pad, you get 65 sheets of 80 gsm paper stock. I grabbed a few items from my pen cup to test, and the paper handled each very well. No feathering or bleeding to speak of, even with liquid inks. There was very slight show through from the liquid ink pens, and the Sharpie did show through quite a bit (as is the case with just about any paper), but even the Sharpie Industrial Marker didn't bleed through to the next sheet. This paper is a very solid performer, and I quite pleased with the results. I don't own any broad point fountain pens, but I'd be curious to see how those perform, too. The second item I received are these A7 TO-DO Sticky Notes. I think these could be used in just about any business or professional environment, or even when dividing up household chores. I work in a sales environment, so I will be using these to track our sales order process to help refine our sales process flow, so these will be very handy for my application, and I'm sure you can think of ways to use this with your own 'TO-DO' items. These Sticky Notes are 120 gsm, so they can easily handle even your most assertive writing tools. You can order Notice Life products at NoteMaker.com.au, and Nicholas is also offering 10% if you order with him directly at noticelife@me.com using the coupon code "Economy Pens offer". Though the Notice Life products are currently being shipped from their home in Australia, the company is working to have the products be distributed in the U.S. as well. What's more, you can also enter a small competition to win one of three A1 2013 Wall Planner Calendars by writing 100 words, or more, about what is important to you when you purchase stationary. You can e-mail your entries directly to Nicholas at the noticelife@me.com e-mail address. Both the 10% discount offer and the competition will go through September, and Nicholas will notify me of who the winners are in the beginning of October. If you have any questions about the products or the competition, please let me know! W.A. Stark is a new company based in my home state of Minnesota. I am in no way affiliated with the company, but one of the staff is an old childhood friend, so he generously sent me out a pen for review. The price of this model, when it was sent, was $49.99, but they currently have a number of pre-configured options available at a discount. 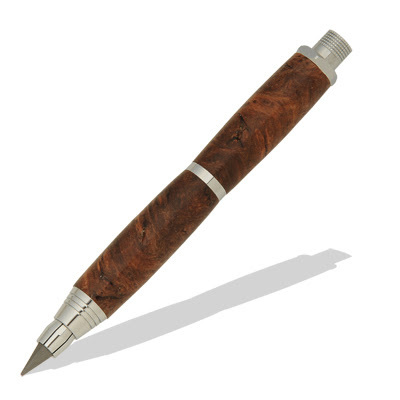 You can select a number of exotic wood types for the barrel, and I also chose to go with gunmetal for the rest of the pen hardware. As you can see, the pen as a small rifle for the clip, a bolt-action retracting mechanism, and the tip of the pen meant to look like a bullet. The target market for this pen is for gun enthusiasts, hunters, and soldiers, and though I am really none of these, I think the design is very clever and attractive. The pen comes with a Parker ballpoint refill, but you can also use the Schmidt P 900 refill or a Parker gel refill. The Schmidt P 900 and Parker ballpoint refills were quite similar in their performance (adequate, but not like the super smooth ballpoints of Japan), but I liked the Parker gel refill the best, which I have never used before. Tip rattle/movement was a slight issue with this pen, but the overall writing experience is pretty decent. Some people are more particular about this than others (I fall into the former category), but it is not a deal breaker. As the name of the pen implies, the pen is 'bolt action', meaning that you slide the bolt down and lock it into the notch lower down the barrel to engage the pen, mimicking the mechanism of bolt-action rifles. The materials, movement, and heft of the pen all indicate that this is long-lasting, quality product - a pen that could be passed down to the next generation as the years pass. As I noted before, the clip itself is a little rifle, which might be 'cool', 'cute', or 'menacing', depending on your perspective of firearms. Minnesota is a state where many residents grow up learning how to hunt and fish, but I realize that not everyone shares this background. The clip feels well constructed and didn't snag on my shirt pocket as some clips do, but it also doesn't move very much, so don't expect much flex in the clip. Both the top of the pen and tip of the pen are meant to look like a bullet. The top of the pen resembles a centerfire cartridge. I am not familiar with the 'PSI CP 8000' designation, but I may ask about it as I am curious. The rich, tropical Cocobolo wood of Central America segues nicely into the metallic hardware. This is a pretty heavy pen, and it is easy to hold without fatigue. I'd say that if you have smaller hands, the pen might be a little substantial, but to me the weight and balance feel quite nice. I think this is a good option for longer writing sessions given that thinner barrels tend to cramp my hands. What's not to like with this color and patterns? Well, if you don't like it, there are numerous other wood types available through W.A. Stark, and additional designs, materials, and formats are sure to come, including the computer drawing of the 5.6 mm Sketch Pencil (I want one) seen below. Head over to W.A. Stark to see what they have available right now, and feel free to e-mail the company if you have any questions or requests. Stride Write, the sole distributor of Schneider pens, sent me this sample several weeks ago, and you may have seen my recent review of the Schneider Xtra Document, a pen that I, surprisingly, enjoyed more than this one. I love needle point pens, especially if they come in a great color (this one is nearly blue-black), and are a really fine point. What I found with this one is that the combination of the really fine ball and liquid ink seemed to be very finicky, at least on the papers that I tried. I ended up doing the review on a Rhodia Reverse Book, and there were occasional start-up issues. Outside of this, I also found the ink to spread more than I would like, so the .3 size was closer to a .5, if not a .6 line. I will admit, I often tend to stay away from liquid ink pens for this reason, though I have a more forgiving approach to my fountain pens. I've said this before, but I think it is easy to argue that Germany and Japan produce the best writing instruments in the world, so I usually anticipate top tier quality when I try products from these two countries, and maybe that isn't fair. What is exciting is that some of the harder-to-find stuff if finally becoming available here in the states; whether people agree on the excellence of a particular offering is less important than the fact that people have access to try it out in the first place, but I digress. The Cap: As you can see, this is a very flashy design. I love the German flag colors on the cap, but the rest of the appearance doesn't do too much for me. I like a cleaner, more subdued look. Again, personal preference. The Clip: The clip works well, but the cap is easily removed from the front, and posts very lightly on the back end, so be weary of getting ink stains in your pants, shirt pocket, or purse. I'd leave this one on your desk or in a pen cup. Grip and Ergonomics: Perhaps my favorite two features of the pen. The grip is comfortable and the pen is easy to hold without strain or fatigue. No complaints here. Pros and cons on this one were pretty even for me, which is unfortunate, but I want to see what others think about this one. If you don't post your cap, and liquid ink pens are some of your favorites, this could be a marvelous pen for you, but I still couldn't recommend this one given the downfalls I experienced.